Roof valleys are a potential problem area all over the world. Kelly brings us the view from down under, but the advice is universal. Sydney is a city with almost 90.000 households, with a projected growth of more than 600 % until 2031. Roof problems are one of its residents’ most common housing issues and people are often forced to do a complete roof replacement. This can be avoided by taking proper care of your roof. Leaks can be minor in the beginning, but with time leakage can become a big problem. In this article, we will inform you about one of the most usual causes - leaking valleys. Valleys are troughs constructed on junctures of two sloped sections of the roof, and their purpose is to lead the water away from the top of the house into the gutter. If you don’t shy away from manual work and you’re good with tools, you can do much of the work on roof maintenance yourself, saving yourself and your family a lot of money. Lifespan of roof valleys is relatively long. They can last for more than 20 years, but external factors can considerably shorten that period. Believe it or not, one of the most common causes for roof leakage is leafs. Wet leafs stick to the valley, and corrosion leads to formation of rust bubbles. These quickly turn into holes on the valley, gradually destroying neighbouring sections of the roof, as well. Leafs can also accumulate in roof valleys, which can lead to forming of ice during the winter. Water expands while freezing, causing shingles to move, which also leads to leakage very quickly. Sometimes workers overlap shingles during the valley’s montage, and, later, water later find its way between them. You can prevent leakage problems by taking good care of your roof. First of all, inspect. Get your self a tall ladder or good binoculars and try to observe what is going on up there. If you spot any of the listed symptoms, react in time and you will save time and money. The best prevention is to keep your roof clean at all times. It is advisable to regularly clean gutters of any accumulated debris, thus preventing any future problems. This is recommended at least twice a year. If there are a lot of trees with branches hanging above your roof, trimming them is also a good prevention method. In this paragraph we will provide you with the tip for repairing leaking and opened valleys. It would be best if you had one assistant. First of all, you’ll probably need extension ladders to climb to a roof. In any case, before you start, make sure that you removed any debris from the valley. Usual methods of repair consist of inserting a sheet metal along the valley, or by simply patching the holes with an appropriate material. If you want to patch the holes, first make sure that you localized all of them, and patch them with the same material valley is made of. Majority of valleys are made from aluminium or copper. Don’t use different material, as this will inevitably lead to corrosion. Fix patches by laying a thick layer of roof cement. If you want to insert sheet metal from the top to the bottom of a valley, first remove the surrounding shingles. Insert sheet metal, and nail it to the roof. After the job, return removed shingles. 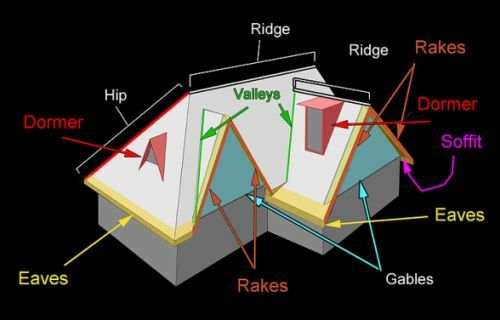 Valleys are the most sensitive element of any roof. Know that their poor construction and/or improper maintenance will always lead to deterioration of much more expensive and important elements, like roof beams. For that reason, don’t take them lightly and regularly check their health, so you would avoid much bigger problems. It is advisable to hire a Sydney roof replacement company or professional roofing company in your city if you are inexperienced because it could cost you more on long runs if you don't fix it correctly. I have some experience replacing roofs and fixing minor leaks. I have seen damage multiplied hundreds of times over because problems were not attended to early. Let me add a little advice from the snow belt. Ice accumulation is probably not a problem in Sydney, Australia, but in Sidney, Ohio it is a big source of roof problems and ice dams usually form where a roof valley meets the gutters. The best defense is proper construction. Roof valleys need a wide belt of a special underlayment extending beyond the flashing. W.R. Grace makes Ice and Water Shield, which is essentially large sheets of Vycor self-adhered flexible flashing, one of my favorite products. A heat mat can also work wonders, and while these are best installed during construction, there are products made for existing roofs. These melt the ice, preventing accumulation.